LAS VEGAS, Nev. and BOSTON, Mass., January 10, 2012 – CES 2012 – Mobile Monitor Technologies (MMT), innovator and maker of the world’s first mobile display, introduced a product at the CES 2012 Showstoppers Media Event that extends the share, work, and watch capabilities of portable displays beyond notebooks and PCs, across the universe of mobile devices. Monitor2Go is a 15.6” LCD LED-backlit display that redefines the entire mobile monitor category. Monitor2Go boasts a 1600×900 HD+ screen that not only extends the displays of USB enabled notebooks and PCs, it also mirrors the displays of Apple devices (iPad, iPhone and iPod) and HDMI compatible smart phones and tablets, as well as carries, protects, and locks the iPad2. 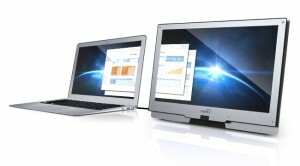 Share – Rotate Monitor2Go’s 15.6” HD+ screen to share bright, vivid presentations, videos, games, apps, and more. Work – Eliminate squinting and hunching over a small screen, with nearly triple the screen real estate of the average tablet. For the notebook, Monitor2Go will extend or mirror the screen for up to 30 percent more productivity as compared to single screen computing. Watch – Connect any phone or media player with HDMI, and you’ve got a mobile theater. Movies, TV shows, home video and photo slideshows in crisp HD wherever you go. Monitor2Go and a new model of the popular Field Monitor Pro will be available in early Q2 of 2012 with list prices under $300. To preorder, visit www.mmt2.com. 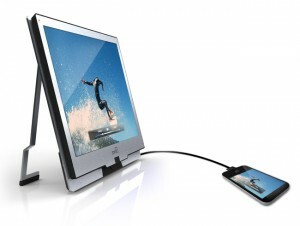 Massachusetts-based Mobile Monitor Technologies, LLC (MMT) (www.mmt2.com) specializes in lightweight durable portable displays for mobile professionals and consumers. MMT’s industry’s first, Field Monitor Pro, has enabled thousands of professionals to enjoy the productivity benefits of dual displays while out of their offices. With MMT’s latest entries, mobile device users also can enjoy the share, work, and watch benefits of portable displays at work, on the road, and at home. Apple iPad, iPad2, iPhone, and iPod are registered trademarks of Apple Inc. Field Monitor Pro and Monitor2Go are trademarks of Mobile Monitor Technologies, LLC. DisplayLink is a trademark or registered trademark of DisplayLink Corporation in the US and other countries. All other trademarks and trade names are the properties of their respective owners. Be the first to comment on "MMT Intros Mobile Display for Apple Devices, Smart Phones, Tablets and Notebooks"